After an NFC North division championship, the Vikings (11-5) will focus their attention towards the playoffs as they square off with the Seattle Seahawks (10-6) in the wild card round of the playoffs. Daniel House previews the game and analyzes every angle of both teams. After an NFC North division championship, the Vikings (11-5) will focus their attention towards the playoffs as they square off with the Seattle Seahawks (10-6) in the wild card round of the playoffs. Temperatures are expected to be below zero on Sunday and it will definitely have an impact on the players, coaches, and fans. The Seahawks come into town with one of the hottest squads in the league. Russell Wilson is having a career year and the Seahawks have the top defensive unit in the league. They have been playing complementary football and it led them to a 10-6 record this season. They've had their share of ups-and-downs, but they've managed to pull together and win when it's most important. As for the Vikings, they've won three consecutive games to close out the season and their defensive unit is starting to get healthy again. However, the offense didn't perform its best last week and will have an even tougher challenge with this Seahawks squad. It will take a perfect performance in all three phases for the Vikings to sneak out a victory on Sunday at a frigid TCF Bank Stadium. Much of the success teams have had against Seattle has come through the vertical passing game. 9 and 8 (fade and corner post) routes have been a huge point of exposure against the Seahawks. Their secondary has had a few miscommunications in the backend and when the cornerbacks are forced to play more man, they haven't had the help they need. The Seahawks secondary improved as the year progressed, but teams have been attacking their Cover 3 look by using plenty of 11 personnel. 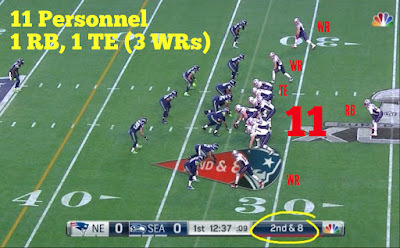 To illustrate 11 personnel for those who are unaware, here's how the Patriots used it in the Super Bowl against the Seahawks. Moving a safety closer in the box allows the opposing passing game to attack the flats, while challenging the free safety who has to cover the deep side of the field up the hash mark. This leaves linebackers covering tight ends up the seam too. Sometimes the strong safety can cover that, but for the most part he's taken care of the flat/curl or is helping the cornerback on the outside. This defense is supposed to help defend the deep ball because the field is divided in deep thirds. The Vikings need to set up the running game so they have the opportunity to isolate better matchups on the outside. When Seattle has been forced to leave Cover 3, they've had some problems. Here is an example of tight end Greg Olsen attacking the Seattle defense in the seam. 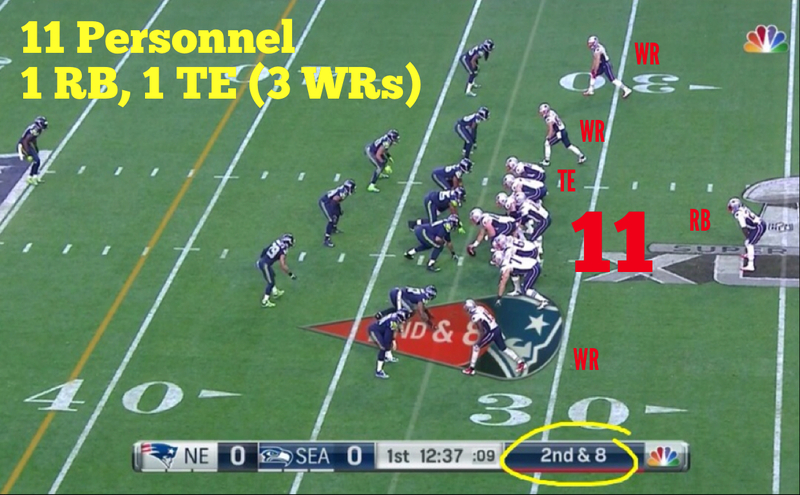 Attacking Seattle's defensive scheme can be done in a few ways. First, it starts by getting the running game established. If you can get the play action passing game in a rhythm, it sets you up for the fade route that has caused headaches for the Seahawks. The problem is, Teddy Bridgewater has to make this throw. He's left too many vertical throws long this season. There is no such thing as a margin for error against the Seattle defense. When the opportunity presents itself, the throw has to be placed perfectly and the play has to be made. Look for Jerick McKinnon and Jarius Wright to be implemented heavily in the game plan as the Vikings' offense looks to attack the flats and the short-intermediate space of the defense. This will set up bigger shots up the field for guys like Mike Wallace and Stefon Diggs, but it's necessary for Bridgewater to connect. He'll have to make all the throws if the Vikings want the chance to advance to the next level of the playoffs. In the previous matchup with Seattle, Teddy Bridgewater had no time in the pocket. In some instances he held onto the ball too long because he didn't have many options, but the protection up front couldn't handle some of the stunts Seattle threw at them. Frank Clark, Bruce Irvin, and Michael Bennett all reached Bridgewater and applied plenty of pressures too. The Seahawks had four total sacks, but the pocket was very messy on almost every occasion. Seattle will definitely try their best to bring pressure that causes headaches and confusion up front. The pocket has to be clean and holes have to be open in the running game. This starts by winning the battle at the line of scrimmage. Last time, Seattle absolutely dominated each line of scrimmage and it led to a 38-7 blowout win. Each of these teams are going to really emphasize the running game as the temperatures are sub-zero during the game. The forecasted high is 0 degrees with a wind chill towards -20 below zero. As Mike Zimmer said this week, the cold doesn't make as big of a difference as the wind. The passing games will have to adjust to a wind cutting across the field at 15-20 mph. The Seahawks will be without Marshawn Lynch in the backfield as he was ruled out with his nagging abdomen injury. Instead, Christine Michael and Bryce Brown will be handling the duties. Michael had 102 yards on 17 carries last week and is a more dynamic threat out of the backfield. He's another player the Vikings will need to break down and tackle in space. Defensive tackle Linval Joseph is returning this week and that will only help the Vikings run defense. It's pretty evident both teams will try to set the tempo by running the ball. Whichever team can move it on the ground and control the line of scrimmage will walk away victorious. Adrian Peterson will have his hands full as the Seattle defense allowed the fewest rushing yards this season. In his earlier matchup with Seattle, the Vikings were forced to pass immediately as they were behind. It relegated Peterson to just 18 yards on 8 carries. He'll need to have more opportunities if the Vikings have any chance of competing in this game. Teams who have brought five or six man rushes against Seattle have had some very solid success. The Seahawks have allowed the fifth-most total sacks this season, but their unit gained some much-needed continuity as the season progressed. However, you can cause headaches for them when you bring pressure off the edge and inside. Many teams have ran exotic blitz packages and disguises that have allowed them to reach Russell Wilson. The St. Louis Rams threw a ton of rushers at Wilson in their Week 16 win in Seattle. Below is a disguise the Rams ran with Akeem Ayers. This is something the Vikings could do with Anthony Barr or Eric Kendricks. When you do this, you have to reach Wilson and make the stop. If he escapes contain and extends plays, he'll start to take the game over. When he escapes the pocket and makes a shifty move, he can pick up huge first downs that wear down the defense and shift the time of possession in favor of Seattle. In the first matchup, he was running all over the field and making throws on every part of the field. In this example, the Vikings rush couldn't get to Wilson and the linebackers were forced into coverage. This time around, with Anthony Barr playing you have to believe he will be spying Wilson for the majority of the game. Wilson has the talent to dictate the tempo of the game and that's something you can't let him do or you'll get blown out. Finally, Wilson has the arm strength and accuracy to cause headaches. He has been dialed in throughout the season and should be in the conversation for league MVP. Wilson has passed for over 4,000 yards and 34 touchdowns. What's more impressive is the fact he has thrown just eight interceptions on the season. He hasn't been making mistakes and the only way you can take him out of the game is by limiting his production. Wilson is so disciplined that he makes very few mistakes, but when he does, you have to take advantage. Here is a look at the dime Wilson dropped to Doug Baldwin in the back end of the Vikings' secondary. Harrison Smith vocally leading in the secondary will help improve the plethora of miscommunications the group faced the last time. The Vikings missed so many tackles in the last matchup with the Seahawks. They relied on a cast of Robert Blanton, Antone Exum, and Jason Trusnik to make tackles in the second level. That's never a very good recipe for success. The Seahawks have so many weapons on offense and you have to be able to break down and tackle them. Russell Wilson, Tyler Lockett, Doug Baldwin, and Christine Michael are all difficult players to take down. Lockett has been a huge rookie sensation this year and his athletic abilities in space have really caused problems for opposing teams. Not to mention, Doug Baldwin has been one of the big weapons as the Seahawks have stretched the field on offense. Earlier in the season, he totally annihilated the Vikings defense for a pair of touchdowns. Baldwin knows how to get open and Wilson can make every throw on the field. Tackling these guys and not allowing yards after contact is extremely important. This group of wide receivers is known for this attribute. They had a high amount of yards after contact the last time around and you simply cannot allow them to make plays after they haul in the reception. As a whole, the tackling, communication, and tenacity need to be better than the last contest. The Seahawks have All-Pro return man Tyler Lockett at their disposal and the Vikings coverage units have to be ready to handle him. Lockett set a Seahawks franchise rookie record with 1,915 all-purpose yards in the regular season. He is a massive threat as a punt returner and set the Seattle single-game record for punt returns yards (139 yards) on four returns last week. The Seahawks have blocked very well for him, but his athleticism and ability to break tackles is really eye-opening. Shifting field position is huge when you face a team of Seattle's caliber. 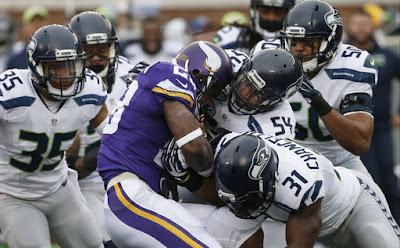 If Lockett gives them good field position, it could put a very big strain on the Vikings defensive unit.